Should memorialisation do more than keep memory alive? As we approach a time when witnesses of the Holocaust will no longer be amongst us to give a first-hand account of their past, Dr Diana Popescu, Research Fellow at Pears Institute for the Study of Antisemitism argues that memorial events must do more than keep their memories alive – it must involve a more direct confrontation with urgent problems we face today. As organisers of memorial events in Great Britain prepare to mark this year’s Holocaust Memorial Day, we are reminded of the vital role that survivors have played in shaping public awareness of the Holocaust. Public memory of the Holocaust rests on their remarkable efforts to share painful stories of survival and of loss. Survivors have passed to us the responsibilities for preventing such atrocities from happening again, and of ensuring that the Holocaust is not forgotten. How well have we risen to these challenges? 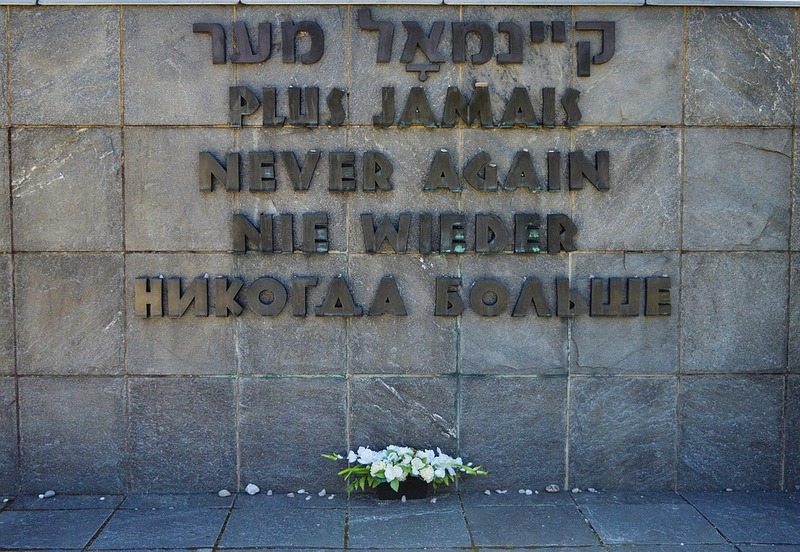 “Never again” had a profound meaning for survivors who uttered the phrase soon after their liberation from concentration camps. In Buchenwald and other camps, survivors held signs on which they had written “never again”, and pledged to build a “new, democratic, and peaceful world”. Later generations have been encouraged to take on this pledge. Holocaust survivor Bob Behr’s hope is that younger generations “feel an obligation to humankind to do whatever you can to help people, to liberate people, to do something good for people”. Behr’s message is echoed in the mission statement of the US Holocaust Memorial Museum whose aim is “to encourage its visitors to reflect upon […] their own responsibilities as citizens of a democracy”. But how does this message resonate with the public today? My own research into young people’s reactions to memorial initiatives reveals powerful emotions and a commitment to social activism. However, the commitment to “Never again” reiterated by younger generations loses potency when it is not mirrored in the present; genocidal events keep occurring, most recently in Myanmar and in Syria. In response to the rise of racism and of antisemitism in Europe, art critic Jonathan Jones wonders “why Holocaust memorials have done so little to prevent the return of Europe’s far-right demons?” If the function of memorialisation is to ensure “Never again”, then it seems that memorialisation does not deliver on its promise. Perhaps it is time that memorialisation demands other responses. A far more honest response and a sobering one might be “Again and again”. Indeed, this phrase appears in visitors’ reactions specifically to artworks dealing with the Holocaust and is often followed by challenging discussions on human shortcomings such as cowardice, conformity, indifference, or passivity. In The Drowned and the Saved, renowned writer and Holocaust survivor, Primo Levi observes that: “Human memory is a marvellous but fallacious instrument”. He continues: “The memories which lie within us are not carved in stone; not only do they tend to become erased as the years go by, but often they change, or even grow, by incorporating extraneous features.” For Levi, admitting to the volatile nature of memory did not mean that memory should be discarded. Instead, Levi invites us to scrutinize how the past is re-elaborated in the present. He warns that “the further events fade into the past, the more the construction of convenient truth grows and is perfected”. The challenge set out by Levi is about deepening our understanding of what remembrance means in the present. If remembering is a process by which the past is reconstructed in relation to the present, then the failures of the present must be more fully and more compellingly integrated in memorial events. That memory is an imperfect tool for representing the past is something which public remembrance needs to acknowledge and deal with. This demands a different kind of education; one which enables young people to relate to remembrance as a phenomenon of the present, rather than the historical past. We are at a critical juncture, approaching a time when witnesses of the Holocaust will no longer be amongst us to give a first-hand account of their past. Taking forward the messages inherited from survivors, memorial events should do more than re-tell their stories, and more than keep their memories alive. They must involve a more direct confrontation with urgent problems we face today. In Europe and elsewhere, intolerance towards difference is notable, hostility towards foreigners is growing. Knowledge-based on real evidence is giving way to simple belief based on untruths and half-truths, and fake news shapes crucial decisions about the future. Holocaust denials surface in public debates at an alarming rate. Holocaust distortions pass on as factual truth as the gap in historical knowledge grows wider. Memorial initiatives can and should engage more daringly with such issues. At their best, memorialisation projects lead to self-reflective and critical acts of introspection. They do not shy away from being provocative, or from inviting one to take part in difficult conversations. They can mirror back at us the failings of the present, together with our own limitations, prejudice, bias, and ignorance. Ultimately, memorial events should remind us of what remains important but is difficult to achieve: tolerance, fairness, justice. Compelling artworks engaging with the Holocaust and indeed with the memory of other genocides are already doing this. It is time for public memorialisation to catch up.